When the nice folks at The Nosher asked me to share my favorite Rosh Hashanah recipe, I knew exactly what I wanted to share. And it made me realize that there are meals and desserts, that — no matter how delicious or well-loved — I only make at specific times of year. This cake is a perfect example. 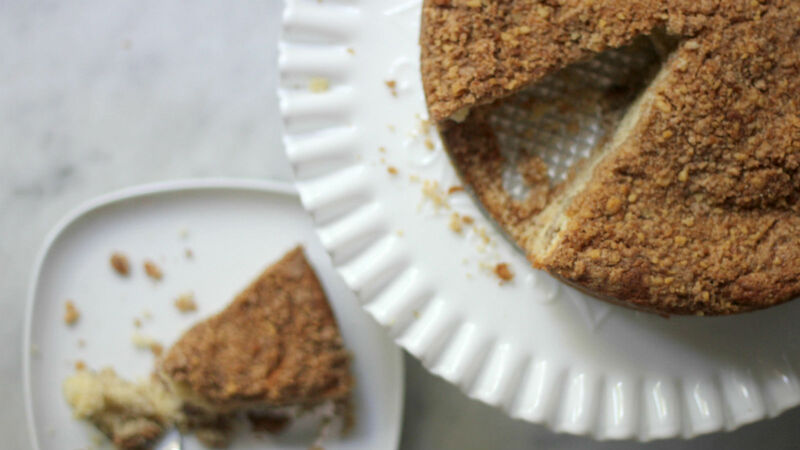 Moist and tender, not overly sweet, and laced with a heavenly streusel topping and filling, this coffee cake has got it all. And it’s super easy too. Yet I only trot it out during the New Year. Sometimes it’s a Rosh Hashanah dessert, sometimes it’s served at break fast. But I never make it at any other time. I think that’s what makes it extra special. You can fill this cake with sliced pears, peaches or apples — but I use the apples, in keeping with the tradition of the New Year. And if I’m feeling extra cheeky, I’ll use Honey Crisps. As this cake also freezes beautifully you can make it in advance, saving a little work when preparing your holiday meal. I hope you enjoy it — maybe it will become a holiday tradition for you too (but I won’t judge if you make it in January.). This recipe is adapted from The Cake Bible. You will need a 9 inch springform pan to make it. Pre-heat oven to 350. Line the bottom of a 9” springform pan with parchment paper – grease and flour the sides and bottom. 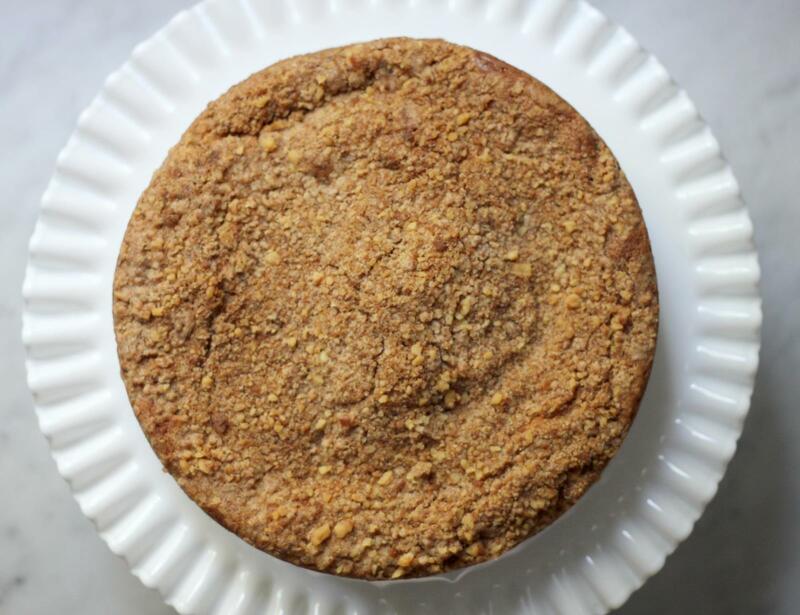 Make the topping/filling: In a food processor combine both sugars, walnuts and cinnamon. Pulse till nuts are coarsely chopped. Remove ¼ cup and put aside (for the filling). Add the flour, butter and vanilla and pulse briefly till mixture is crumbly. Set aside (this will be the topping). Make the cake: In a medium bowl lightly whisk the yolks, ¼ c. of the sour cream and vanilla. Combine the dry ingredients in a mixer bowl and beat on low speed for 30 seconds. Add the butter and remaining ¾ c. of sour cream. Mix on low speed till dry ingredients are moistened, and increase speed to medium – beat for 2 minutes. Scrape down the sides. Add the egg mixture in 3 batches, beating for 20 seconds after each addition. Scrape down the sides. Pour 2/3 of the batter into your prepared pan, using a small angled spatula to smooth the surface. Sprinkle with the reserved filling and top with the sliced apples. Use a spoon to dollop the remaining batter over the top and gently smooth. Sprinkle with the reserved topping. Bake for 55 to 65 minutes, or till a cake tester comes out clean. Cool cake in pan on a rack for 10 minutes. Loosen the sides of the pan with your small metal spatula and remove. Cool completely before wrapping. This recipe is more about look and feel than about exactness, and it allows for a lot of tweaking. This go-to chicken recipe, with a glossy and delicious sauce, is perfect for Rosh Hashanah or Shabbat.